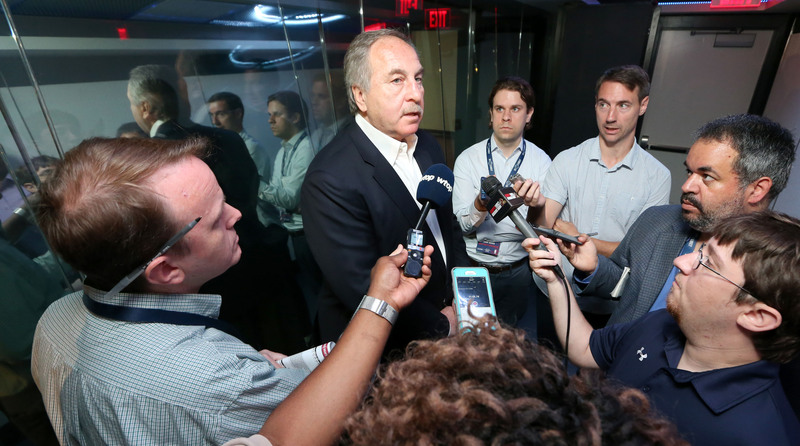 What’s Next for Wizards After Firing Team President Ernie Grunfeld? The Ernie Grunfeld era in Washington is officially over but Washington's rebuild is far from the end. The Crossover on what's next for the Wizards. The NBA is a results oriented business, unless you are in D.C., where the Wizards allowed team president Ernie Grunfeld to rack up a 568-724 record over 16 seasons without ever whiffing a championship. That run ended on Tuesday, when Washington fired Grunfeld, weeks after the Wizards had locked up a losing season and days after Washington was eliminated from the playoffs for the second time in four years. “We did not meet our stated goals of qualifying for the playoffs this season,” Wizards owner Ted Leonsis said in a statement, but ending the Grunfeld Era had as much to do with one season as climate change has to do with a couple of extra Hummer sales. The Wizards lacked the talent to be a title contender this year, but the injury to John Wall—whose season ended in late January, with a torn Achilles tendon that will likely cost him most or all of next season—blew up any chance of the Wizards surprising someone in the first round. Without Wall, Washington bottomed out, and Grunfeld began the rebuilding process by offloading the contract of Otto Porter. But you only get so many cracks at rebuilding, and Grunfeld has had a few of them. He appeared to be on to something in the early 2000’s, when the Gilbert Arenas-led Wizards looked like a team on the rise, before Arenas’s knee problems and the infamous gun incident ended that groups chance. The pairing of John Wall and Bradley Beal created a swashbuckling bunch that stunned the Bulls in the 2014 playoffs. But that team never advanced past the second round. None of Grunfeld’s teams did. You can point to coaching decisions (four years of Randy Wittman set the Wizards back) and free agent signings—inking Ian Mahinmi to a four-year, $64 million deal in the summer of 2016 was an all-time bad signing; Andrew Nicholson (four-years, $26 million) and Jason Smith (three-years, $16 million) were pretty bad, too. But don’t get it twisted—the draft is what really did Grunfeld in. The draft is where GM’s make their bones. Oklahoma City’s Sam Presti is an elite executive because he believed in Russell Westbrook (No. 4 in 2008), spotted Serge Ibaka (No. 24 in ’08) and identified Reggie Jackson (No. 24 in 2011), among others; Utah’s Dennis Lindsey has hit on mid-to-late first round picks like Donovan Mitchell, Rudy Gobert and Rodney Hood. RC Buford’s track record in San Antonio speaks for itself. Draft well, and your chances to win increase exponentially, and Grunfeld simply didn’t draft well. He wasted mid-first round picks on Jarvis Hayes, Nick Young and JaVale McGee. His European fascination introduced Washington to Oleksiy Pecherov and Jan Vesely, the latter of whom was taken ahead of Klay Thompson and Kawhi Leonard. Grunfeld traded the fifth pick in the 2009 draft for Randy Foye and Mike Miller, bypassing the chance to draft Stephen Curry, DeMar DeRozan, Jrue Holiday or Jeff Teague. That last sentence really has to make Wizards fan wince. Credit Grunfeld for Beal, who has overcome injury issues early in his career to look like a franchise two-guard. And before injuries began to chip away at Wall’s lower body, the Wall-Beal backcourt was regarded as one of the best in the league. But championships are not won with stars, they are won with the talent you mine to put around them. The Wizards failed at that, somewhat spectacularly. There will be strong interest in the Wizards GM job, but this isn’t a typical rebuild. Wall will begin the first year of a cap-crippling, untradeable four-year, $170 million extension, and there are no guarantees that he will ever be the same. Beal could be eligible for a supermax contract this summer, and Washington will have to decide if it wants two players eventually gobbling up more than half of its payroll. Beal’s history of leg problems has to be factored in, too. A new GM will have to make a decision on the future of head coach Scott Brooks, who is finishing year three of a five-year, $35 million deal. Brooks has his critics, but it’s hard to pin the failures of this team on him, and if the Wizards do go into a full scale rebuild, having a former Coach of the Year with a long history of player development could be an asset. But this team does need a rebuild, a full scale rebuild, a long rebuild, because whatever this team thought it could be, it never will be. The Wizards needs the brightest drafting mind it can find, which could mean someone on Presti’s staff (Troy Weaver), Lindsey’s (Justin Zanik) or elsewhere. Patience will need to be at a premium, because the talent infusion this team needs is substantial. Grunfeld’s exit ends a rough time in Washington basketball history. Buckle up, though—it’s about to get rougher.